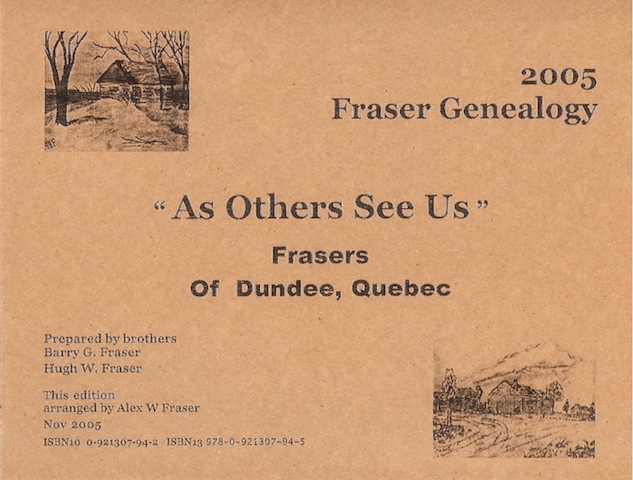 Announcing the 2001 Reprint of This Fraser Genealogy Update is in a similar format as done in the 2001 AOSU reprint but enlarged and updated to 2005. Due to the formatting and additional columns, now 28 compared to 21 in the original version, it mades more sense to publish this update as a separate volume rather than try to shrink the information on to 1 - 8.5" x 11" page. This Fraser Genealogy Update is a 2 page spread showing the 28 columns across the open page and the information contained in each is quite readable without a magnifying glass. The size of this work; Intro 25 pages, The genealogy is 28 columns wide and 1545 rows deep amounting to pages 26 to 100 in landscape page format. In addition to this 1st part, above mentioned I have also included the same in an A - Z format for easier locating of the surnames so listed of the main line of descendants, using the family names in columns L, J, K as the basis for this effort. This is an additional pages 101 to 177. This 2 volume set is available the price is $108.00 shipping included Can funds to a Canadian address. Please Contact Us for details on ordering.